The SBC635MBISSHVTWIN is a full-sized beer dispenser that can store a full half barrel keg or two 1/6 barrels to best accommodate all tastes. 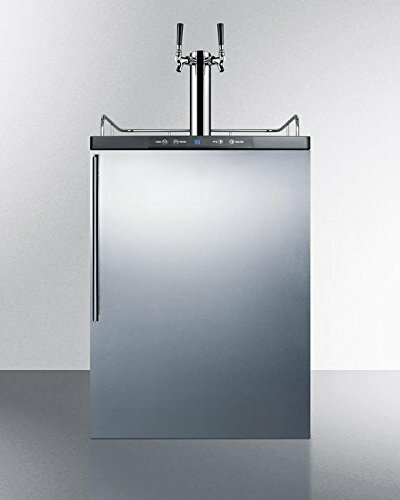 It features a front-breathing design for built-in installation under counters, with a stainless steel wrapped door and sleek handle for a modern look. The surface includes a removable drip tray to collect spills and a chrome guard rail to help keep glasses and mugs in place. This unit is height adjustable from 33 1/2" to 34" to best fit your undercounter space. Please note that the door does not open in its own radius. When planning your cutout, if the unit is mounted against a wall or flush under cabinetry, you will need between 25 and 25 1/4" width for proper ventilation.